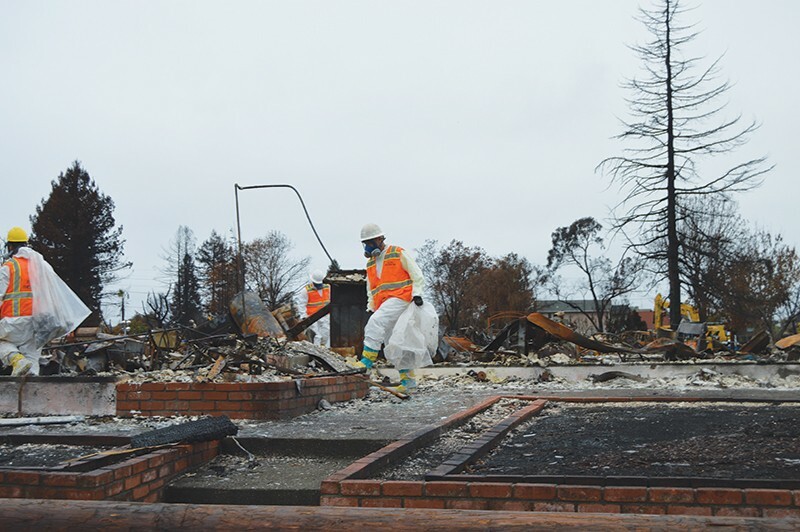 In the wake of the 2017 wildfires, a wave of federal contractors descended on Sonoma County, promising to manage the situation for those recovering from the disaster. It would prove to be the largest wildfire cleanup the federal government had ever managed—but, in many ways, it did not go well. As the recovery got underway, local politicians told media outlets that they had spotted workers for one company, AshBritt Environmental, operating without proper safety equipment. In January 2018, the same company ceased its debris-removal work for several days while filing complaints against other federal contractors. In December 2017, an employee of one of AshBritt's subcontractors was crushed to death by his own truck while working at a Petaluma garbage dump. A report by KQED published in July last year found that the federal cleanup in the Bay Area was far more expensive per-house than the state-run cleanup after the Thomas fire in 2015. Meanwhile, AshBritt has been attempting to get more work in the state, in line with the disaster-service company's time-honored strategy: develop local, state and federal political connections, give money to both political parties, and hope for the best. In early December 2018, as the cleanup for the Butte County Camp fire got underway, following a U.S. Government Accountability Office report unpacking the federal government's use of contractors during its response to the 2017 disasters, California officials announced that they would manage the cleanup of the 2018 fires in an effort to solve some of the problems identified in the GAO report. By the time Governor-elect Gavin Newsom and President Donald Trump met in the wreckage of Paradise in November, both men—or political action committees supporting them—had accepted campaign contributions from AshBritt. A month before the Paradise meet-up, Ashbritt hired Platinum Advisors, the powerhouse Sacramento lobbying firm headed by Darius Anderson, and set out to try and secure the cleanup contracts in Butte County. But the AshBritt strategy appears not to have worked as it sought to get a piece of the cleanup business in Butte County; AshBritt was rejected for two contracts in this year's state-run cleanup after submitting high bids, according to a CalRecycle spokesperson. Last Aug. 18, Mark Ghilarducci, director of the California Governor's Office of Emergency Services (OES), wrote a letter to the U.S. Army Corps of Engineers that detailed the feds' poor showing in the 2017 cleanup. In Sonoma County alone, he noted, there were "600 reports of over-scraping, 80 additional properties that are so over-excavated a major engineering fix will be required and 260 properties with other damage to septic systems, wells, driveways, and retaining walls." The federal government's 2017 North Bay cleanup cost an average of $280,000 per house compared with $77,000 during the state-managed 2015 Valley fire cleanup, according to an analysis by KQED. AshBritt invoiced the Army Corps for a total of $320,351,681.07 for its work in California from October 2017 through June of 2018, according to federal records. In December, state officials announced that a state agency would oversee this year's wildfire cleanup after state and local officials criticized the work of federal contractors during the cleanup effort in the North Bay last year. Ghilarducci also criticized the federal agency for its "egregious oversight" of contractors. "Given these subcontractors were paid per ton of soil removed, it is probable this over-excavation was an intentional effort to capitalize on this tragedy by defrauding the government," Ghilarducci wrote. Ghilarducci's letter was well-received by Sonoma County Supervisor Shirlee Zane. The letter aligned with the complaints of many fire victims. "This letter is just awesome, because this is exactly what we were talking about, that these fire survivors were victimized because of the negligence in the hiring of these contractors by the Corps of Engineers," Zane told the Press Democrat at the time. In fact, the 2017 cleanup went so poorly that the California officials announced in December that CalRecycle would manage the cleanup of the November 2018 fires instead of the federal government. The 2017 fires were not the first time AshBritt faced criticism for its work, as the Bohemian has previously reported (See "Fire Wall," Sept. 18, 2018). A congressional oversight report about the debris-removal process after Hurricane Katrina swept through the Gulf Coast found that the Army Corps of Engineers awarded no-bid debris-removal contracts to four companies immediately after the hurricane struck. After receiving federal contracts, the companies went on to set up "contracts with four or more layers of subcontractors collecting a cut, while the people doing the actual work receive pennies on the dollar," according to the report. "In addition, there are reports of double-billing for debris, making excess claims based on mileage, receiving payment for ineligible debris, and other fraudulent practices," the 2006 congressional report states. The report resulted in a policy change undertaken by the federal government's disaster-response agencies. Instead of awarding contracts in the wake of disasters, FEMA would now pre-award disaster contracts long in advance of disasters. The policy change does not appear to have changed the results. Three companies who won contracts after Katrina—AshBritt, ECC and Ceres Environmental Services—were awarded competitive debris-removal contracts in 2014 by the Army Corps of Engineers and were later called on to respond to the 2017 fires by FEMA. A Dec. 6, 2018, report from the U.S. Government Accountability Office about the use of federal contracts in response to 2017 wildfires and hurricanes found numerous flaws that affected the cleanup process in California. For instance, federal and state officials had differing expectations about "what structures would be removed from private property and acceptable soil contamination levels," according to the GAO report. There were also communication issues identified by the GAO. For instance, state officials were in contact with FEMA officials, but not those in charge of regional contracts, according to the report. Contractors also exploited a clause in the Army Corps contract allowing them to charge by weight instead of volume. "While hurricane debris is often priced by volume, [Army Corps] officials stated that the wildfire debris had to be priced by tonnage, and wrapped to prevent contamination," the GAO report states. An April 2018 lawsuit brought by a San Francisco law firm alleges that an AshBritt subcontractor, Tate's Tree Service & Construction, did not pay minimum wage, and failed to compensate employees for lunch breaks, overtime and rest periods, while operating without licenses required to work in California. AshBritt and Justin Tate, the owner of Tate's Tree Service, were fined by the Contractors State License Board for operating without the proper licenses, according to KQED. In court filings, lawyers for AshBritt refuted all of the lawsuit's claims. The case is pending. The Army Corps will award new debris-removal contracts for its South Pacific Region, the region that covers California, Nevada, Utah, Arizona and New Mexico, in April 2019, according to the December GAO report. The Army Corps did not respond to questions about whether the debris-removal contract for the district has been changed in any way to avoid the issues that emerged during the 2017 fire cleanup locally.